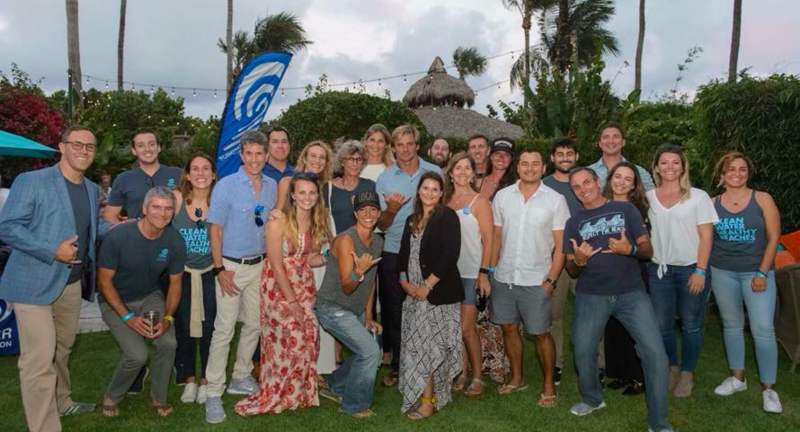 Why and when did you get involved with the Surfrider Foundation? I became obsessed with surfing in the early 1980s, and was a kid during the 1970s eco movement. Remember the 70s TV commercial with 'Iron Eyes Cody' at the site of a polluted river? It had a real influence on us kids. By the 1990s, Surfrider had become one of the environmental organizations that I began contributing to annually. However, that was nothing more than mailing in a small check every year, at the time. I then met Leon Richter, the current chairman of Surfrider’s Board of Directors, back in 2005 when he was looking into water quality issues along the west coast of Puerto Rico, and I was encouraged that my donations were going to a viable organization making a difference. Then I moved to Miami Beach in 2008, and soon came across members of the local Surfrider chapter at a public meeting about a submerged artificial reef proposed for my new home surf break. I was very impressed with their message and conviction, and decided then and there to get involved. Little did I know that they threw the best surf flick parties in Miami Beach. What are some local issues that are affecting your ocean, waves and beaches? Numerous coastal issues are affecting the entire globe. Consumer waste and micro-plastics plague our coastal waters everywhere, and the waterways near Miami are no exception. But the beach trash could come from anywhere as the Gulf Stream is just 3 to 5 miles offshore. Sewage spills and leaks, as well as the chemicals we use in our daily lives, also get into our local waters and flow into the bay and ocean. The interruption of the natural flow of rainfall from Lake Okeechobee towards the south and into the Everglades has had some pretty significant impacts on the entire ecosystem of South Florida. Fresh water laden with nutrients is redirected into large rivers to the east and west of the lake causing the proliferation of blue-green algae blooms in these rivers as they flow towards the coast. The ultimate discharge of this nutrient-rich water into the Gulf helps feed persistent episodes of red tide, or red algae blooms, along the Gulf Coast. For the first time in memory, the red tide made it from the Gulf all the way around the tip of Florida to Southeast Florida this past fall, making beachgoers really wary of being exposed to toxins from just surfing or swimming in the ocean. The Miami-Southeast Florida area is also one of the most vulnerable metro areas in the U.S. to both sea level rise and storm surge. Due to continued over-development in low lying islands and coastal communities, king tides frequently flood neighborhoods along Biscayne Bay, including Miami Beach, even during dry weather. These extreme tides overflow low lying banks along the bay and canals, and rise up into the streets through our storm drains that traditionally have not had any check valves to block incoming flow. As might be expected, heavy rainfall events also produce significant flooding in low elevation areas. To make matters worse, Miami Beach has been fighting eroding beaches for decades, and have run out of local sand sources for large scale beach renourishment projects that have been the typical solution. 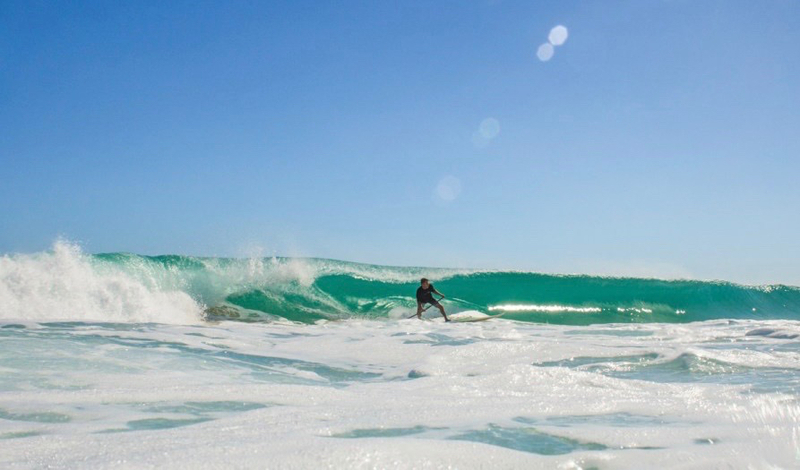 Waves are still good in Miami Beach, when we have swell, as 30 years worth of sand replacement projects by the U.S. Army Corp of Engineers remain on our sandbars and just offshore. Coral reef health in Southeast Florida is also declining. The Southeast Florida Reef Tract, the largest offshore reef in the U.S., has been in poor health for several decades, and recent surveys suggest that over 50% of the reef has died off since the 1960s. Local populations of fish and other marine life have thus diminished. Oh the agony, when will it all stop! What Surfrider projects have you worked on? 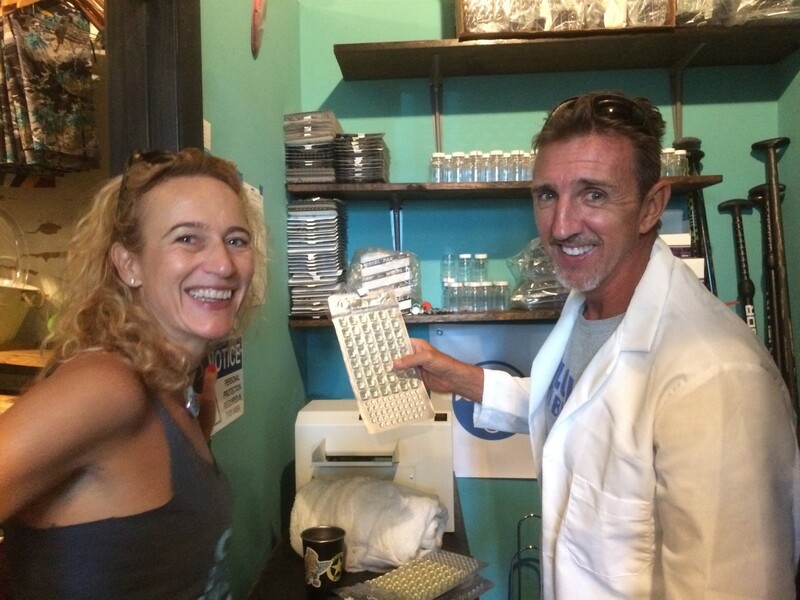 I used to oversee all of our local programs as the former chair and vice-chair of the Surfrider Miami Chapter. 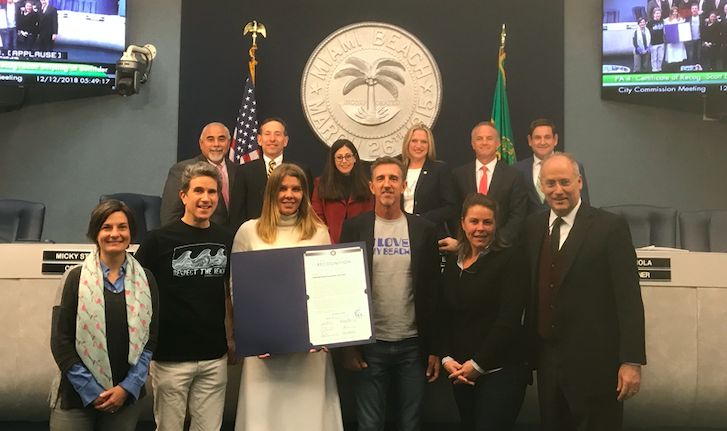 In the past decade, our chapter has mostly focused on dune restorations along Miami Beach, beach and bay cleanups, RAP initiatives, and public education. In the past few years we have begun to reach out beyond the surf community to the wider watersports community, participating in and tabling at area SUP races, and sharing Surfrider messaging with the kiteboarding community. In March of 2018 we launched a new Blue Water Task Force lab (BWTF), and I am now director of this volunteer water quality monitoring program, organizing training, sample collection, and data distribution. Through the BWTF, we have become a contributing partner with the Biscayne Bay Health Alliance, which is a broad coalition of local stakeholders focused on assessing the health of the bay, identifying pollution and other toxic sources, and working to implement policy solutions to restore the health of the entire ecosystem. What has been the highlight of your Surfrider experience? Due to the lack of frequency of waves, the Miami chapter has plenty of time to be one of the loudest and more active chapters in Florida. We have had several victories over the years, including a handful of minor beach access victories. Our strongest wins to date are styrofoam and plastic straw bans in several coastal communities. State legislation prevents local municipalities from enacting plastic bag bans, but we are working to defeat this state pre-emption in Florida. 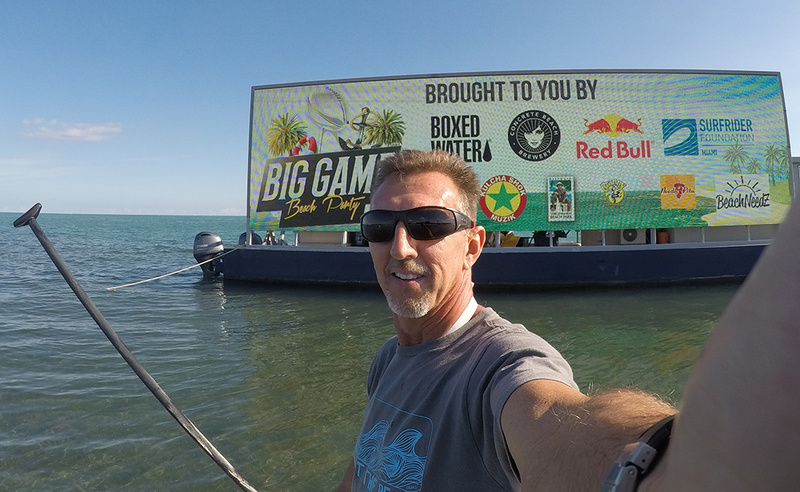 We have also hosted and partnered on numerous events with amazing influencers such as Yann Bertrand, producer of Planet Ocean, Laird Hamilton and Gabby Reece, Jack Johnson and the crew of Five Gyres. Getting recognition on the street and beach when wearing Surfrider gear is always enriching too. If I had to single out one moment or experience, it would have to be when Marcus Erikson, founder of Five Gyres, autographed my personal copy of his book “Junk Raft” and thanked me for all that I do to save our seas. What is the most important thing you tell others about Surfrider? That many people have no idea of the extreme negative impacts that modern human society is having on our planet. Man has become so disconnected from nature. As defenders of our coasts and oceans, Surfrider is working to educate the general public of these detrimental impacts, and sharing ideas to help us all make changes in our everyday behaviors to reduce or stop our negative impact on the planet. Why are you a Surfrider coastal defender? I have always enjoyed the outdoors and nature, and want to make sure that my offspring and future generations will have the opportunity to experience the same joy and magic that nature has provided me. As life would have it, my career and passions gradually merged as I transferred with my NOAA job to Puerto Rico in 1992, where I lived a dream life for 17 years. I expanded from surfing, to windsurfing and kitesurfing, sailing, exploring the Caribbean, and become a true waterman. How could I not do everything in my power to help save the planet and share its magic with the world?